Pow’r-Riser Lifting Jack. 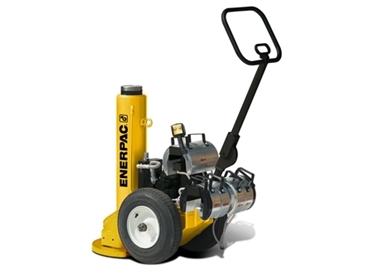 from Enerpac (A Division of Actuant Corp) combines a high capacity (54-181 ton) cylinder and an electric or air-powered hydraulic pump unit integrated into a mobile cart. Enerpac Pow’r-Riser mobile jack has the speed, power and versatility for a wide variety of on-site site applications, including servicing tires, tracks and other maintenance functions on heavy equipment, lifting and positioning of large constructed elements and many other applications that require heavy lifting equipment in remote locations. For safe mechanical cribbing of a lifted load, accessory Locking U-Rings can be placed around an extended piston and come in four lengths for each POW’R-RISER capacity. They are available individually or in sets. Locking U-Rings are accommodated by storage racks integral to the Pow’r-Riser mobile jack. Pow’r-Riser mobile jack provides safe, efficient, mobile lifting and load-holding for the toughest applications and is backed by Enerpac’s extensive product support. This support includes national and worldwide networks of local distributors and authorized service centers as well as regional customer and technical service centers. Can be rolled into position for easy placement. No exposed hoses or fittings to damage. Electric motor fully enclosed to withstand elements. Narrow width for hard-to-reach areas. Wide selection of capacities, strokes and jack heights for a variety of applications. Sup-R-Stack Extension System allows lifting at all heights without blocking.